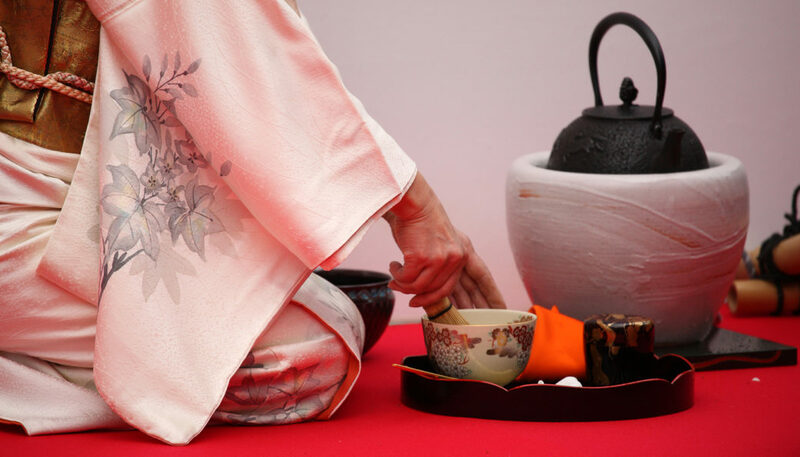 Japanese Tea Ceremony is perhaps the most enigmatic of the traditional arts. Unlike the more familiar daily brew of steeped green tea, or o-cha, tea for the ceremony is made from bright green powdered matcha, and served with the utmost care during an elaborately restrained ceremony. Also called chanoyu, sado, or chado, the ceremony is, quite literally, ‘the way of tea,’ or ‘[making] water for the tea.’ Most famous of the Zen arts, drinking the stimulating matcha began in the monasteries as an aid to meditation. Developed as an art by the samurai in the thirteenth century, it was formalised two centuries later by the great tea master Sen-no-Rikyu, who laid down rules linking tea ceremony to the arts of calligraphy, flower arranging, and ceramics. A full tea ceremony is traditionally performed in a specially designed tea house within a formal garden. The guests enter the tea house through a door so low that everyone must stoop to enter, signifying equality within the tea house. Traditionally samurai weapons were left outside: people entered unarmed and thus equal. Chanoyu ceremonies vary in length depending on the food and tea served, from a light and very traditional kaiseki dinner accompanied by both thick and thin whisked teas, to a simple bowl of thin tea complemented by a Japanese confection. Chanoyu, however, is more than a simple serving of food and tea. Tea ceremony rests on the fundamental principle of wabi, a refined and subdued aesthetic. Great attention is paid to the precise and delicate movements of the host, the instruments used to serve the tea, as well as to the ikebana flowers and shodo calligraphy displayed in the tea room. Tasting the tea is simple enough, and can be sampled at nearly all traditional gardens and many Buddhist temples, but arranging a full tea ceremony and following the rules can be confusing without the language. Into Japan is happy to do the hard work for you and arrange tea ceremonies at an English-speaking private tea room in Kyoto.